6:00 AM Left Pangong started towards Manali. The road to Changla is probably in the worst condition of all roads in this sector. 8:54 AM Reached Chang La. Stopped at the cafe, took some pictures. Started our descent from Chang La. 10:09 AM We see the diversion from the main, road, you just have to get off the hill. Apparently, the road is being redone and that's why there is this diversion. As we reached the end of Diversion, we took a wrong turn and ended up on really bad road. We drove for probably a couple of kilometers on this bad road. Suddenly the car lost all the power. 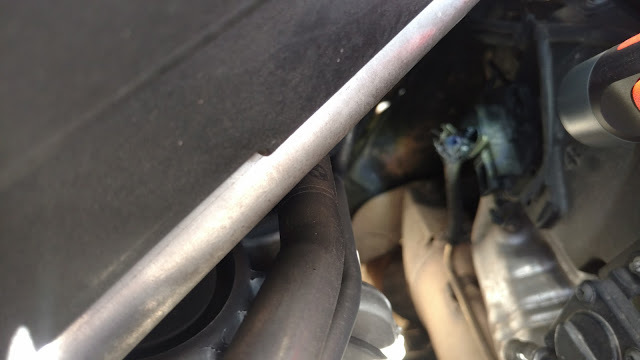 On closer examination, we found that a hose that connected to exhaust was completely torn up. 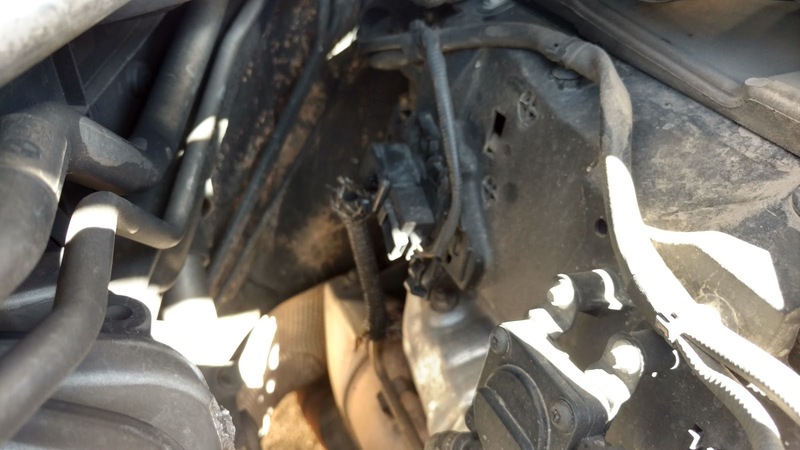 We checked with OBD, we found multiple alerts related Diesel Particulate Filter. After some time the car lost power steering and breaks as well. 11:00 AM We called the vehicle dead, Beemer had died for no apparent reason. We had to sadly pronounce that our trip has to be abandoned. The challenge before us was to get out of this dead-end place where we were stuck. There was no soul on this stretch of the road. There was no way we were able to take our car to a more public place, I asked my brother to go and find some help. 12:45 PM He found a local pickup guy who very grudgingly, very unhappily helped us tow the vehicle to a more public part of the road. Meanwhile, we called Road Side Assistance. At this time we realized that we were some 17 kilometers away from the place called Karu. Karu is the place where the road from Manali meets Leh-Pangong road. The roadside assistance informed that they don't have any tow trucks in Leh, they will get a truck from Manali and that will take 15-16 hours. On further discussion, they told us that they have sent the truck and we should leave the key somewhere accessible and inform the tow truck driver. Fortunately for us, one of my friends was in Leh, so I requested him to arrange a taxi for us, gave him the location. 4:00 PM The taxi arrived. We parked the car on the roadside and left with the taxi to Leh. The taxi driver told us to leave the key with the Druk Restaurant owner in Karu which is in an easily visible and accessible place for the tow truck to locate. 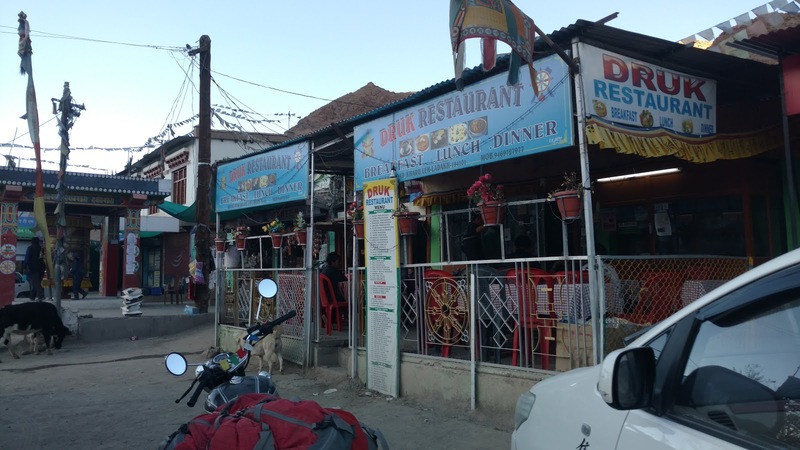 With our trip abandoned, we had some lunch at the restaurant, left the key with the owner and continued towards Leh. 6:30 PM We finally arrived at Hotel in Leh. We stayed at Hotel Grand Himalaya. Here is our review of the place.